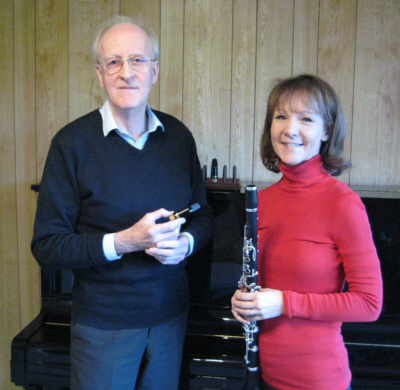 Peter Eaton recently announced his retirement from clarinet production, although he will continue to make mouthpieces, and hopes that a way forward for the English clarinet will emerge. Here, he tells the story of the large-bore clarinet and the genesis of his own manufacturing business. The large-bore English clarinet almost died twice, firstly in the late 1940s and then again in the 1980s. Can it survive for a third time? This is the story of my involvement with it. The unique sound of the English clarinet, as made by Boosey & Co., Hawkes & Son, Boosey & Hawkes and Peter Eaton, has been with us for well over 100 years. Some of the world's most gifted and successful musicians have given performances and made recordings on English clarinets that set the benchmark for musical performances on clarinet. These players included Reginald Kell and Frederick Thurston in the 1930s, Gervase de Peyer and Jack Brymer of the post-war generation and, much more recently, Emma Johnson and Richard Hosford. The youngest generation of great young English players including Katherine Lacy, Mark Simpson and Anna Hashimoto maintain this long tradition with distinction. The large-bore English clarinet was developed by Boosey & Co. towards the end of the 19th century. The basic bore dimension of .6 of an inch (15.24 mm) extended throughout the instrument and fully into the mouthpiece. There has never been another clarinet with those characteristics. The genesis is lost in the mists of time but acoustician David Blaikley, who worked for Boosey for around sixty years until 1930, must surely have been a considerable influence and Jack Brymer believed that George Clinton was also involved. Following the merger of Boosey with Hawkes & Son in 1930, my dear old friend Brian Manton Myatt took on responsibility for clarinet design, the same role he held with Hawkes from 1925. One of his first tasks was to consolidate the specification for the Boehm system, since most of the clarinets made by Boosey had been simple system or Clinton model. As a very fine player himself, Brian kept his prototype, a full Boehm example, because he played all parts, both B-flat and A, on the one instrument. Throughout the 1930s these instruments, which we now commonly refer to as "pre-war 1010s", dominated the clarinet world in the United Kingdom. The mouthpieces that accompanied them were also outstanding, made by hand from rod ebonite by one particular craftsman. Brian's successor, Geoffrey Acton, told me that it was essential to get one that he made in the morning because the ones produced in the afternoon were never quite as good, following his enjoyment of a liquid lunch. When Boosey & Hawkes recommenced clarinet production at Edgware after the war, export revenues from the United States were absolutely vital for the company, so they asked Brian Manton Myatt to design a new model to suit that market. Brian was intensely a Selmer man at heart and his new model, the Imperial 926, was essentially the same as a pre-war Selmer but with a slightly larger bore. This design was used throughout their range of instruments including the Emperor and Regent models and numerous other variations on that theme. As with the 1010 in 1930, Brian's prototype was a full Boehm instrument, again kept for his own use. Brian emphatically considered the 926 to be the orchestral instrument, 1010s being merely instruments for military band use. Unfortunately for Brian, the great Frederick (Jack) Thurston disagreed. Thurston was principal clarinettist with the BBC Symphony from its formation in 1930 and was an enormously influential teacher at the Royal College of Music. So, Brian was obliged to reintroduce the 1010 in 1952, much to the delight of some of Thurston's young students, including Colin Bradbury (principal clarinettist with the BBC Symphony for many years) and John Fuest (principal clarinettist with the CBSO and later Royal Liverpool Philharmonic). Sadly, standards were not nearly as high as in the 1930s. Thurston wrote to the company complaining about this, saying that the instruments were "not as good as the pre-war job". John Fuest agreed and quickly reverted to his pre-war instruments. I knew Brian personally, having first met him at his home in 1966, just before I joined the Ulster Orchestra as principal clarinet. He had retired to Bournemouth in 1954 aged sixty-five. During his retirement, he would happily reface mouthpieces for anyone who asked. I went down to see him to ask if he could make a copy of my favourite pre-war 1010 mouthpiece. Over the next ten years I visited him twice more and there were also telephone calls and numerous letters. Brian was a great letter writer and fortunately I have retained most of them. He has been a great influence on my own work. The quality of the 1010 did not improve much until Brian's successor, Geoffrey Acton, introduced some improvements in 1963. My own pair of 1010s were of this vintage. Geoffrey added his Acton Vent mechanism in 1965 and more worthwhile developments in 1967. Some readers will know that Reginald Kell played instruments made in France by the Martel brothers but they were unlike any other French instruments and were without doubt quintessentially English in nature. They were adored by many great English players in the first half of the twentieth century, including Charles Draper and also Thurston in his earlier years. This unique instrument, produced by the wonderful collaboration of the two Martel brothers, ended with their demise. Many Martels were imported by Hawkes & Son, marked as if made by the English company but they were without doubt Martels. I have written detailed assessments of three famous examples which will eventually become another article for this magazine. No similar instruments were produced until the early 1990s when I developed our International model, which is in many respects closely aligned to the Martels. From the mid-1970s many English players were abandoning their 1010s, changing to French instruments made by Buffet Crampon. 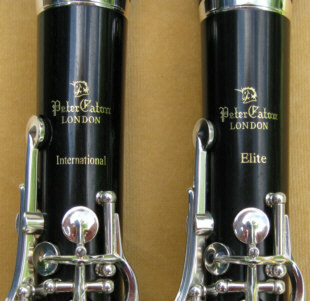 The English clarinets had not developed significantly since the 1960s and production standards had fallen, whereas the French makers had continued to move forward. Taking advantage of the situation, Buffet mounted a strenuous and ultimately highly successful move into the English market, led by another old friend, Alan Lucas. Playing styles then started to change as young players emerged who had not played English instruments in their early years. I was aware of the unsatisfactory situation at B&H and felt strongly that I could introduce significant improvements and restore the reputation of the English clarinet tradition. Between 1982 and 1985, in conjunction with ex-B&H craftsmen Tony Ward and Derek Winterbourn, we produced some very fine English large-bore clarinets which were immediately taken up by some of the most eminent English players. These instruments incorporated a number of significant design improvements including a new bore configuration, patented in 1982. Emma Johnson changed to an Eaton clarinet just three weeks before she won the BBC Young Musician of the Year competition in 1984. Other instruments from the forty or so made by that team went to Gervase de Peyer, Roy Jowitt, Richard Hosford, Ian Herbert and Hale Hambleton, all players of the highest international calibre. Jack Brymer would have joined this list of great players but, at age 70, arthritis in his hands made it very difficult for him to change instruments, though he certainly wanted to and continued to be one of our strongest advocates. It has been a great privilege to work with some of the world's finest musicians and clarinettists, some of whom have become personal friends. In the early 1980s, Boosey & Hawkes acquired the French maker Buffet Crampon and ceased clarinet production in England. I was fortunate enough to be able to buy vital production equipment and parts from them in January 1986, which enabled me to establish the business in its current form. I then recruited an engineer to design and build special purpose equipment for the production of joints, drilling of tone holes etc. My wife Joanna, a professional clarinettist herself, has always been my strongest supporter. The superb craftsman Graham Pinder, the last woodwind specialist at B&H, joined us in 1987 as did Charles Kendall in 1990. The first model we produced was the Elite, a large bore instrument in the 1010 tradition, but with more precise intonation and evenness of sound. It continues to be highly successful. Many clarinettists will know that their playing centres around one particular mouthpiece, usually a small bore mouthpiece. This meant that players who wanted to try our large bore instrument were obliged to change mouthpiece before they could even begin. I therefore wanted to design an instrument that preserved most of the characteristics of our large bore Elite but which could be played on a standard small bore mouthpiece. I also kept firmly in mind the wonderful qualities of those very old Martel clarinets, so loved by players in the first half of the twentieth century. The introduction in the early 1990s of our small bore model, the International, provided the perfect solution. This model can be played with the same type of mouthpiece as used on all French instruments, enabling players to make the changeover immediately. I feel very fortunate to have had the opportunity to make a significant number of clarinets over the years. The numbers are small compared to the large manufacturers but I made a conscious decision to keep this as a cottage industry, mostly managed within our own workshops at home. I have relished being closely involved at all stages of manufacture, from bringing in the wood from Africa to tuning and voicing the finished instruments. I have also enjoyed engaging with our customers, both the illustrious professionals and the passionate amateurs. Every one of our instruments feels very special to me, so I care that they continue to be used by appreciative players. My plan all along was to bring back the highest standards to the English clarinet and restore its reputation worldwide and I believe that I have done so. The English clarinet undoubtedly appeals to players of other traditions around the world, when these musicians are given the opportunity to get to know them. They sit in the hands of leading professionals in places as far apart as Los Angeles, Budapest and Moscow. There is considerable potential for growth with an appropriate marketing strategy. Now that I'm retiring from clarinet making, this business awaits people who can expand it appropriately, increase production and sales but at the same time maintain standards. Is there a future for the English clarinet? The answer to this question depends on whether anyone suitable comes forward with an interest in taking on the business and leading the English clarinet through the 21st century.